How many people do you usually entertain? Do you have a big family? Is it for restaurant use or personal use? Are you buying for everyday dining or a special occasion? Perhaps you're looking for a traveling set? These are only some of the questions you need to answer before getting the best cutlery set for you. A standard cutlery set consists of a fork, spoon, a teaspoon, and a knife. 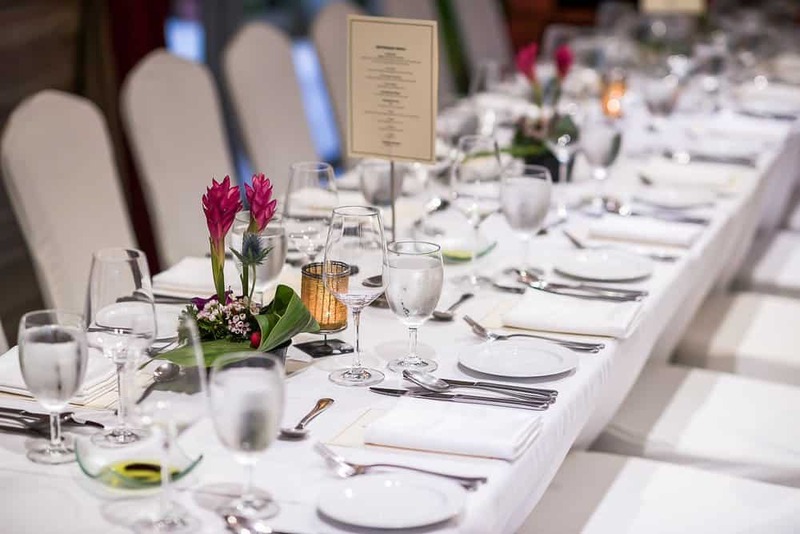 Depending on the type of table setting you prefer to achieve, you may add more items such as a soup spoon, a salad fork, and butter knife. An extensive cutlery set includes more types of spoon and fork implements and often used at a more formal dinner setting. What's The Difference Between Cutlery And Silverware? What Do Cutlery Sets Include? You probably associate cutlery with its root word, "cut", and it's valid. But a cutlery set doesn't solely consist of cutting instruments. So, in the United States, cutlery is more commonly known as "silverware". Some people even call it "flatware". However, not all cutlery sets are made of silver, which causes confusion to many, so Americans who refused to call it "cutlery" have begun calling it flatware instead.The city of Sheffield thanks history as it holds bragging rights to manufacturing the highest quality cutlery in all of England. William Turner pioneered the cutlery industry in Sheffield, England, and the city enjoyed a monopoly of the English cutlery trade in the 17th century. In the United Kingdom and its neighbors, the term "cutlery" is still actively used. You will see these numbers: 18/10 and 18/8 when shopping for cutlery. These show the chemical compositio﻿﻿n of the steel. 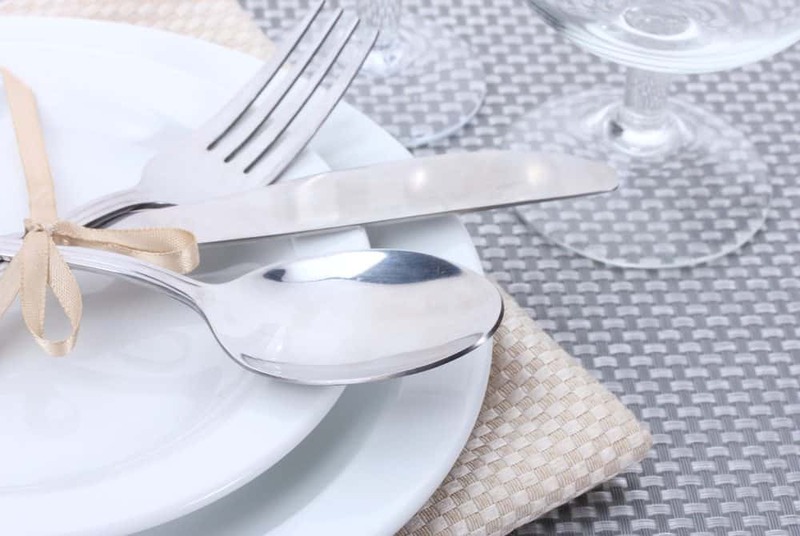 18/10 means the cutlery is made of 18% chromium (hardness) and 10% nickel (shine and corrosion resistance), while 18/8 means it's 18% chromium and 8% nickel. Sterling Silver - U.S.-made sterling silver will have a mark that says "Sterling" or ".925".U.S.-made sterling silver will have a mark that says "Sterling" or ".925". 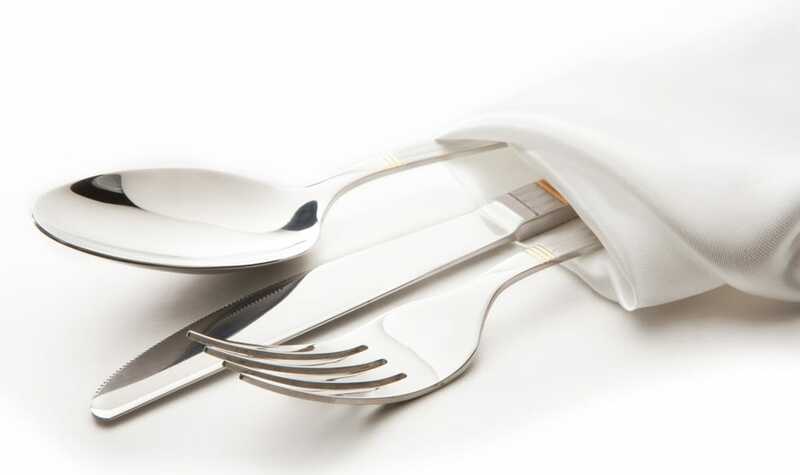 A cutlery's design plays a prominent role in its pricing and maintenance. The more traditional designs are often intrinsic and are obviously pricier. Classic designs will have simpler shapes and almost no distinguishing feature. Some will have stamped patterns which may include the manufacturer's name. Signature designs will have an engraving of the designer's name. Standard cutlery sets will include the basics - a knife, spoon, and fork. For formal dinners, elite, or diplomatic table settings, an extensive cutlery set is fitting. Cutlery sets may include different knives that serve different purposes. Each type is designed to perform a particular task, depending on the food it'll be used for. At a formal dinner setting, the knife is placed to the right of the plate, with the sharp side facing the plate. You don't usually use a spoon in your everyday meals unless you're serving soup. But at a formal dinner setting, you'll see different types of spoons placed to the right of the knives. Each spoon on that table serves a specific purpose. Irrespective of your handedness, forks should always be placed to your dinner plate's left. You'll see forks that have two tines (prongs). These are for cutting meat. Three and four-tined forks are used for everything else. You'll be surprised to see an array of specialized forks in the more extensive cutlery sets. The Bruntmore 40-piece Silverware Set comes with a mirror-quality polish and will not hold any water mark or rust. The simple design, its shape, and smooth edges are timeless and are suited for both everyday use and special occasions. Each piece is carefully wrapped in a polyethylene bag, preventing moisture during packaging and transport. This cutlery set is made of 18/10 stainless steel that is inflexible. The design offers a good grip for both children and adults. This 40-piece silverware contains eight (8) of each: salad fork, smaller fork, tablespoon, teaspoon, and knife. Teaspoon size is the size of a normal tablespooon. Let's take a moment to appreciate the intrinsic design on t﻿﻿his cutle﻿﻿ry set. This beautiful collection adds a touch of elegance to yout table setting which makes it perfect for a more formal dining event. The 65-piece set includes twelve (12) of each: dinner fork, salad fork, dinner spoon, teaspoon, and dinner knife. It also includes two tablespoons, a cold meat fork, a sugar spoon, and a butter knife. There's no question about its constructions' durability and strength as it's made of 18/10 stainless steel. All pieces are dishwasher-safe. The Lafayette 65-piece Flatware Set collection from Ginkgo International boasts of a colonial, hand-hammered design. The hammered finish on the handles create a stunning mirror tile-reflection. All handles taper from a slender neck to nice smooth round tab end. The spoon bowls are squoval (square and oval) in shape. The prongs are a bit longer than normal, and are perfect for salads. This cutlery set is also available in sets of 20 and 42. The 65-piece set includes five (5) of each: butter knife, solid spoon, slotted spoon, meat fork, and a ladel. This 20-piece flatware collection from Utopia Kitchen best exemplifies the classic cutlery - clean, simple, timeless, and functional. Made of stainless steel with a hi-luster finish. The sculptured handle and engraving provide a textured feel for users. Set includes (4) dinner forks, (4) salad forks, (4) teaspoons, (4) dinner spoons, and (4) knives. The pieces are all dishwasher-safe made. Bigger pair of spoon and fork may be too big even for adults. This Farberware Chipotle Sand cutlery set from Cambridge Silversmiths is a 20-piece set that includes four (4) of each: salad fork, dinner fork, dinner knife, soup spoon, and teaspoon. All pieces are made of 18/0 stainless steel and have a brushed finish on the handles. The pieces weigh an average of 2.9 pounds each and measures as long as 11.2 inches. This cutlery set's manufacturer has been supplying flatware to Better Homes and Gardens, Food Network, and celebrities. Considering price, design, construction, and composition, the Bruntmore 40-piece Stainless Steel Crux Silverware Set emerged as the winner in our books. Not only are the pieces fitting for adults, but our kids didn't have a problem holding the spoons and forks. The grip is its best feature, while its 18/10 stainless steel strength and rust-resistant feature comes second. Although a bit pricey, we can say every dollar was worth it. If you're looking to get a larger set for a buffer or regular entertaining purposes, we highly recommend the Bruntmore Crux Silverware Set. It met all of the requirements and after two years of use and proper care, we're still using it! Have you purchased a rather expensive cutlery set as a gift and it came out disappointing? What is your deal breaker when buying cutlery? Let's share funny stories or useful tips in the comments below! Did you find the article useful enough for you to share it? Please do, we'd appreciate it!